My sister was in town this weekend! I am always happy to have some good sister time when I can convince her to break away from her busy, busy life being an AHA superstar. 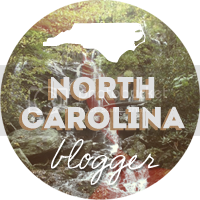 Other than Triangle Restaurant Week and a food truck roundup in Durham, there wasn't too much going on in the area so I didn't make any big plans. We would have used our weekend time to go for a hike at Umstead, but it's just too cold! Stupid January...grr. We all agreed to venture to North Hills on Friday evening to have dinner at Cowfish, which has been on our "check it out" list since it opened. Sushi + burgers? Yes please! Cowfish doesn't take dinner reservations so I called the restruant around 5:30 before we left our apartment to ask what the wait time was looking like. The seating hostess told me that there was currently no wait, so we packed it up and headed over right away. We arrived 20 minutes later to find a line almost out the door and a 45 minute wait! But, we were committed so we put our name down, were assigned a fish called Wanda, (not really, our fish was called Fred Finstone) and were handed a buzzer that would let us know when our table was up. Luckily our buzzer had a good range so we left Cowfish and walked next door to World of Beer. Walking into World of Beer for the first time felt like giant golden gilded doors were thrown open and we were ushered into a palace of beer with a cozy, relaxed vibe. Yeah. Seriously. Why haven't we gone there before? All three of us ordered pints from the mixed draughts list and all three of us were very pleased with the results. After our pints our buzzer went off and we braced ourselves for the cold on the way back over to Cowfish. The first time you dine at Cowfish it is a good idea to ask your server to walk you through each page of the menu. I am so glad that our waitress did just this. I would have been lost among the 100 pages of apps, salads, sandwiches, burgers, sushi, buger/sushi combos, burgushi, etc. It's a hefty menu. After re-reading the entire menu I decided to order a bento box with the slider of the day and a sushi roll called, "The Boss". The bento box comes with 3 sides so I picked bacon coleslaw, sweet & spicy cucumber salad, and sweet potato fries. I totally forgot to take a photo because I was enjoying my meal so much, but if you want a visual, Google it. Or better yet, come visit and we will go to Cowfish for an amazing dinner. I forgot to mention that we split a tall, Jim Beam, boozy milkshake. Yummmm. After dinner all we wanted was couch time so we came back to the apartment, caught up on a few TV shows, and Dana taught me how to crochet! Saturday morning started with homemade breakfast sandwiches and hot beverages. Eventually we got dressed and ventured out into the daylight. We stopped at Old Navy, then Whole Foods for snacks. After lunch we happened to have 3 hours to kill so we saw Wolf of Wall Street and then went to Sweet Tomatoes for dinner. We slept in then talked about going out for brunch, but no one us wanted to get dressed right away and it was still cold. In the end I made Videri chocolate chunk pancakes and we watched Shark Tank. After breakfast Dana and I went to Kohl's in Brier Creek where she changed my life by teaching me how to find the perfect bra. Seriously. Life changing. We also picked up a couple of new blouses and racked up some points on my Kohl's rewards card. We left and went to pick up lunch to-go from Guasaca, a must whenever Dana is in town and then headed home to video chat with the family, eat our Guasaca, beautify ourselves with mud masks, discuss our shared love for Disney's Frozen, and practice my new crochet skills. Dana headed back to Greensboro Sunday evening and we got ready for the work week. Why can't every weekend be a sister weekend?